BBC – Melbourne, Australia- For many women buying makeup in a department store can be an intimidating experience, and Jo Horgan was no different. The 49-year-old says that she often found it uncomfortable that different brands would have their own counters or concessions, staffed by women who would only push those lines of products. So if a customer wanted to buy a number of different brands, she or he would have to walk from counter to counter. “It could be an intimidating experience,” she says. Rather than dreading her trips to buy makeup, and then doing nothing about it, back in 1997 Jo Horgan recognised a business opportunity – and opened an upmarket cosmetics shop that sold a large number of different brands that her staff would recommend entirely on merit. Living in Melbourne, Australia, she quit her project management job at French cosmetics giant L’Oreal, and launched her own company, which she called Mecca. Selling her home to help raise funds, she opened her first Mecca boutique in the city’s upmarket South Yarra suburb, selling cosmetics from cult brands such as Nars, Stila and Urban Decay. Today, 21 years later, Mecca has 87 outlets across Australia and New Zealand, and reported annual revenues of 287m Australian dollars ($223m; £157m). Ms Horgan’s relationship with cosmetics began early, when she was a little girl who enjoyed watching her mother apply makeup at their home in London, England. When Ms Horgan was 14, her family relocated from the UK to Australia, settling in Perth. Like most teenage girls she loved wearing makeup, but she never planned to work in cosmetics. After graduating from school in Perth, she studied English literature at the University of Western Australia, before doing a masters in communication at Boston University in the US. She then started working for L’Oreal, first in London, and then relocating to Melbourne, so she could return to Australia. Ms Horgan says that she was attracted to L’Oreal more out of an interest in marketing than makeup, and that working for the company turned out to be a crash course in business and entrepreneurship. “It was very demanding, very uncompromising, and you were expected to deliver results from the outset,” she says. Mecca’s stores bring high-end cosmetics under one roof. When Ms Horgan left L’Oreal to set up Mecca she was just 29. She says that being relatively young meant that she had a pretty good idea of what young makeup lovers were looking for. While Mecca has grown steadily over the past 21 years it has not all be plain sailing. A few years after she started, the value of the Australian dollar dropped, making it far more expensive for the company to buy the international products that its customers wanted. “That was really cataclysmic,” says Ms Horgan. “Because you watch your cost of goods double, and you can’t go to the customer and say ‘sorry, we need to double the price of the product’. Instead of markedly putting up prices Ms Hogan had to cut her profits. She now looks back on the episode as a valuable lesson. “In retrospect I consider it a gift,” she says. “It was an incredibly useful early example for me of changes I needed to make to my business model to actually make that viable. An even bigger challenge arrived in 2014 when French cosmetics store giant Sephora launched in Australia. Owned by French luxury goods multinational LVMH, Sephora now has 13 outlets in the country. Statistics from Arna Richardson, an cosmetics industry analyst at market research group Ibis World, shows that there is more than enough space for both firms in the sector in Australia. 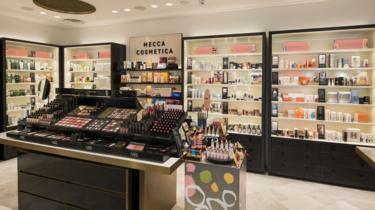 “Given the sheer size of the industry, Mecca has a market share of less than 3%, despite its 70-plus stores,” she says. “Sephora, in comparison, has 13 stores and a market share of less than 1%”. Where Mecca has an edge is in its early and now extensive use of ecommerce and social media. The company was selling online as far back as 2001, and uses the likes of Facebook and Instagram to promote itself and connect to customers. Its website gets nine million page views a month. To stand out from its competitors, Ms Horgan say that Mecca works hard to ensure it offers the “absolute benchmark” of good customer service. To help achieve this the company says that 3% of its turnover is spent on training its more than 2,500 employees. Ms Horgan adds that much of Mecca’s success comes from choosing the right people to be around her in the first place. These include her husband and Mecca’s co-owner Peter Wetenhall, who joined the business full time in 2005 as co-chief executive. The couple, who have two children, had met while both were studying in the US in their 20s. Ms Horgan says she likes to tell him that she is the boss, but that in reality it is really a partnership. “I really do see us as co-CEOs, because we bring different skill sets to the party,” she says. “You know what, I don’t think I’m such a great boss,” she says. “I think I have enough self-awareness to know there are so many areas I’m not good at.